Enjoy the beautiful waterfront views from your porch. 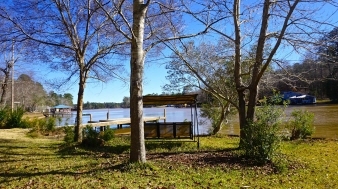 240' Lake Harding waterfront footage on .9 acre level lot. Huge dock, retaining wall, & personal boat ramp. Cabin would make a wonderful second home w/ add-on potential or tear down for new house. Cabin features large porch, 1 bedroom & bath, kitchen area, & living area with fireplace. Paved road to the driveway. Beautiful homes surround this property. It is hard to find a large level lot in such a great location with such potential. Additional Features and Amenities GA Power Lease- seller will contribute $5000 towards lease transfer. Storage building. Large level lot.